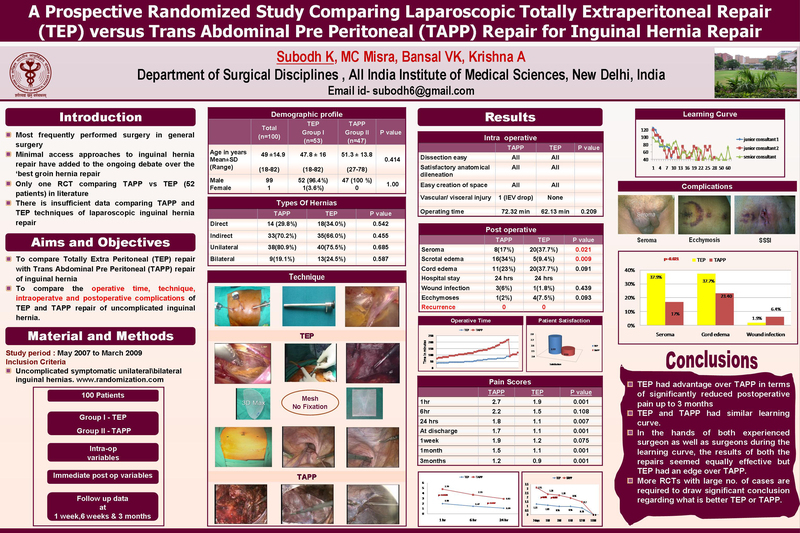 Laparoscopic inguinal hernia repair has the advantage of lesser pain, early recovery and lesser wound morbidity. There is no consensus on the best groin hernia repair. There are two standard techniques of Laparoscopic Inguinal hernia repair – Total Extra Peritoneal repair (TEP) and Trans – Abdominal Pre-Peritoneal repair (TAPP). There are not many trials available comparing the two techniques and questions remain about their relative merits and risks. The present study was undertaken to compare the two techniques in terms of operative complications and follow up. This prospective randomized study was done from 1st May 2007 to 31st December 2009. 100 patients were randomised to either TEP repair (Group1) or TAPP repair (Group 2) by random numbers from www.randomization.com. Only patients with uncomplicated inguinal hernia were included. InTEP repair space creation was done by 30 degree telescope. The mesh was not fixed in both the groups and in TAPP repair peritoneum was closed with 2-0 polydioxone. Both the techniques were compared in terms of intra operative ease of surgery, intra-operative problems, conversions and time taken for surgery. Acute and chronic pain was also compared on visual analogue scale. All patients were followed up for a period of 12 months. The variables were compared using chi – square and unpaired Student’s‘t’ test for qualitative and quantitative parameters as appropriate.Mann Whitney test was used for the comparative data analysis. 100 patients were randomised (Group I – 53 patients and Group II – 47 patients). Both the groups were comparable in terms of demographic profile and hernia characteristics. There were no conversions in the study. There was no visceral or vascular injury. Average operating time was longer in TAPP (85min) compared to TEP (70 min) although this was not statistically significant (p=0.209). Seroma formation was more common in TEP (37.25%, p=0.021) whereas TAPP had a higher incidence of scrotal edema (34%, p=0.009). Pain score on VAS was significantly higher in TAPP at 1hour, 24 hour, 1 month and 3 month follow up (p=0.001,0.002,0.001 and 0.001) . However the pain scores were levelled in the two groups at 6, 12 and 18 months follow up(p= 0.231,0.342,0.90). The patient satisfaction was lower in the TAPP group mainly due to the higher pain scores recorded in group II up to 3 months follow – up. The operative time taken by junior consultant was significantly higher than senior consultant (78.6 minutes vs 62.8 minutes, p=0.02). However the difference was not statistically significant for TAPP vs TEP between the consultants (78.6 mintus vs 77.6 minutes, p=0.12). TEP had significant advantage over TAPP for a significantly reduced postoperative pain up to 3 months which resulted in better patient satisfaction score. There was no significant difference in both the procedures in terms of operative problems or post operative recovery.